A lot of the top 50 killings are faithfully taught to children in illustrated Bible stories. I learned more than 1/3 of them in children's Bible lessons, many of them presented quite vividly in felt. There's an impressive list of Bible stories in "felt" at http://www.thefeltsource.com/Bible-List-of-Lessons.html. The series includes -- of course -- "Lot's wife disobeys." But it may surprise you that the series even includes "Nadab And Abihu Disobey." Imagine teaching children that one. Never pass up a chance to teach a child obedience. Steve, do you plan to rank the top 50 based on our "rantings" or just our "ratings" or maybe both? Eric, it amazes me that any of these stories would be told to children or to anyone else. They are absurd, cruel, and immoral. I'm not sure yet how I'll rank them. But I'm pretty happy with the way the ratings are turning out. Any rating is subjective, but it helps to spread it out a bit. I think that God stopped the sun for Joshua's slaughter should make the list - and not just because of my connection to Joshua via my first name. After all, when else does God add time for a killing? He could have just smitten them with some hail, or fire, or smoke - but no, they had to all die at the end of a blade. You know those "Good News Bible Clubs"? The one sponsored by Child Evangelism Fellowship -- probably the largest Children's Bible lesson developer in the country? 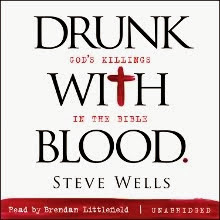 God's Top 50 Killings are popular CEF flannelgraph stories. It was some time later that Samuel came again to King Saul and said, "Listen to the Lord's message. (Place figures 13 and 17, Samuel and Saul) You are to go and entirely destroy the Amalekites -- people -- animal --every living thing. Nothing shall be left." The Amalekites were a very wicked nation who tried to get rid of God's people many years before. God took care of His people and promised that some day He would destroy the Amalekites (Exodus 17:8-16). Now, that time had come. And Samuel went home, leaving Saul to carry out the command of the Lord. (Remove figures). "The Lord chose you to be king over Israel when you didn't think you were so important." Samuel must have been thinking about that monument that Saul had built to honor himself. He continued, "The Lord sent you out under His orders. He said 'Completely destroy the Amalekites, those evil doers.' Now why haven't you done it?" How dreadful to refuse God's way for our own proud way. God is not satisfied with anything but complete obedience. But you cannot obey the Lord until you've trusted Him as your Savior from sin. This is, of course, followed by a teacher-directed sinner's prayer. The section on I Sam 15 is 2 pages long. It's a whole lesson. It's long. The summary mentions the guide covering the "victory over the Amalekites." Gotta inoculate children to the barbarity of the Bible while they are still young. Joshua, I agree with you about the sun-stopping killing in Joshua 10. I've added it to the list (#48). I know I'm preaching to the choir here (for lack of a less abhorrant metaphor), but opponents of religion need to come out and say it: religion is child abuse. not just the murders perpetrated against children in the old testament, and not just jesus's curses upon successive generations after an initial trespass. But here, in the present, in every church and synagogue and mosque, millions of children are being taught that God will murder them, often painfully and slowly, for disobeying him. That, once murdered, their immortal souls will burn and rot in a very real hell with very real fire, torment, and torture for all of eternity. That our human nature is inherantly evil. That our very instincts, urges, appetites, though god-given, are abominations before an all-powerful murderer who, in the words of Christopher Hitchens, can convict us of thought crime even while we sleep." We, as rationalists, need to be vocal advocates for the emotional and psychological well-being of children everywhere and say loudly and forecfully that religion is emotional and mental child abuse. The intent of the abusers is of no consequence. When a misguided father beats his children becuase that was how he was taught to discipline kids, we don't condone his violence because his intentions were good. We take his kids away, lock him in prison where he belongs, and offer the children various methods of recovery. I have suffered for years, and still do, from anxiety, nightmares, panic attacks, and self-hatred because my mind was molded by these hateful beliefs and, like all mental habits, especially those of born of abuse, they are intractable to a large extent. No child should have to suffer like this and it's time we said so. Xtians seem to thing meek Jesus is waiting in the wings whilst daddy is slaughtering the innocents..but Jesus is the very one killing them.. The link above explains the reasoning for destruction that God used. It was always just, God gave hundreds of years of warnings and time to change their sinful ways, plus the people destroyed were always as evil as you could imagine, e.g. many sacrificed their own children to false gods. Just do your research and you will see the author of this blog probably wants to lead you to Atheism. I hope he can find his way back into Christianity because if you read chapter by chapter you can't fully understand the old testament and only receive a small piece of what actually happened and why, you have to do your research. Awesome site. I have passed it on to all of my peeps. Did it occur to you that the word "God" is a purposeful mistranslation? God can mean many words, including man, judge, magistrate, king, priest, Caesar, and other men acting as "gods." In the beginning the "gods" (Elohim) created the heavens and the earth. In other words, they re-created nature into the legal realm. Then the "gods" (Elohim) said "Let US create man in OUR image." Does this not strike you as strange? What you attribute to God is false. God is not a person, and certainly not a man. Jehovah (God) is a verb, meaning all that is, was, and shall be. I Am That I Am. All other gods are a noun, a name and flattering title for men seeking to rule over man and nature. Sadly, these purposeful mistranslations will prevent many from finding the true wisdom, the "mystery" of the Bible, which tells you how to escape from these magistrate gods by going back to Nature (Jehovah). Every word you read must be searched for to get its true meaning. Otherwise, you will blame man's crimes as Jehovah's (Nature's), which is called personification or anthropomorphism. We have all been played, tricked into ignoring the knowledge of the scriptures because the gods can only rule the ignorant.